Why is it so important to be clear on the difference between Conventional, Natural and Organic? Sadly in the food industry ‘conventional’ implies the food is grown normally. But if you reflect on your grand parents day the use of pesticides and GMO was not normal, so conventional which means food grown using synthesized (man-made from chemicals) fertilizers, possibly genetically modified seeds, and possibly growth hormones & regular antibiotics (in the case of meat) so is in fact anything but conventional. Generally means no chemicals, genetically modified seeds, or hormones/antibiotics. As there is rigorous testing and expense involved with becoming organic. it is very common for small, local producers to market themselves as natural, non-certified organic, spray free, because they generally aren’t doing enough business to justify the time and expense to become certified organic. Natural is not regulated so it’s not a guarantee of anything. This is the customer’s guarantee that all products manufactured by a company adhere to strict and rigorous criteria defined by an appropriate certifying body. Organic food is produced without using conventional pesticides; fertilizers made with synthetic ingredients, antibiotics and growth hormones. Some people lean away from conventionally grown food because they are concerned about putting chemicals in their bodies, while others are motivated by environmental concerns. The certification criteria, i.e., Certified Organic encompasses every step of the process from pre-planting of the soil through to dispatch of the end product to the consumer via the warehouse. Is there a simple way of perhaps looking at the difference? Many people think ‘organic produce’ and believe it is just about the things that are ‘added’ to the process that defines organic, it is not until prompted that the penny drops that it’s also about what is ‘missing’ with organic produce – that being pesticides, herbicides and toxic synthetic chemicals. It is only then that organic & certified organic becomes meaningful. 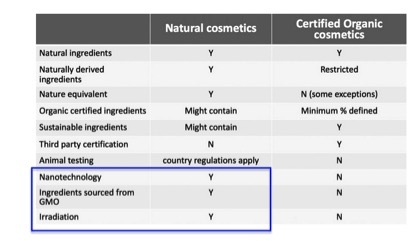 If we take the cosmetic industry as an example The Australian Certified Organics (ACO) has produced a criteria against which certified organic products are assessed. When you review the criteria or Certified and Natural, it is easy to see the differences. Amongst the difference Natural allows ingredients to be sources from genetically modified plants. In my next blog post, I share what some of the Conventional and/or even “Natural” products contain that Certified Organic don’t? Make sure you join us on our Mums and Babies Online Global Health Summit (http://www.mumsandbabieshealthsummit.com/register-here/) a FREE online global summit where you will have access to the worlds’ leading experts who discuss everything pertaining to mums and babies health including pre, during and post pregnancy.